I eluded in my other post from today that I've been on a bit of an Ebony Tee bender...I haven't made 542, but it sure feels like it! 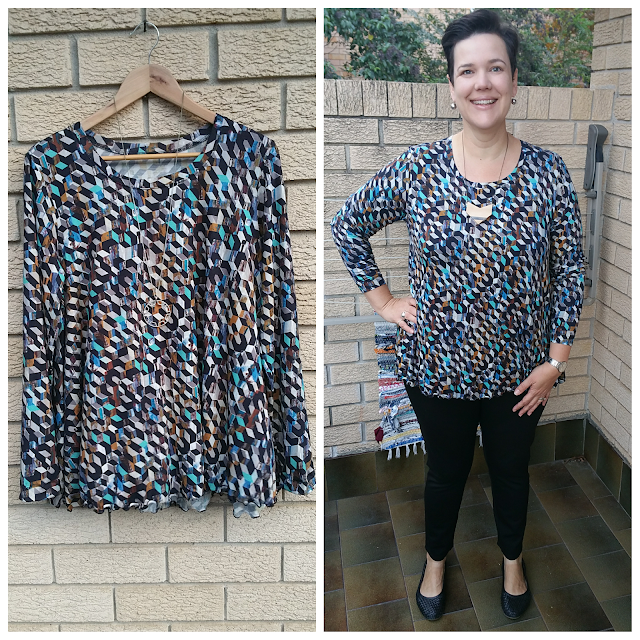 This first top was meant to be a dress, but based on the length of the tee I thought it too would be really short. I went about adding 2" to the length which also entailed adding width. Short version - WAY too big and sack like and WAY too long. I decided to just turn it into a tee rather than faff about taking in the sides. It's a different shape to my other Ebony Tee's as I just cut along one of the stripes and then rolled the hem...it's dipped at the sides and shorter at the front/back. 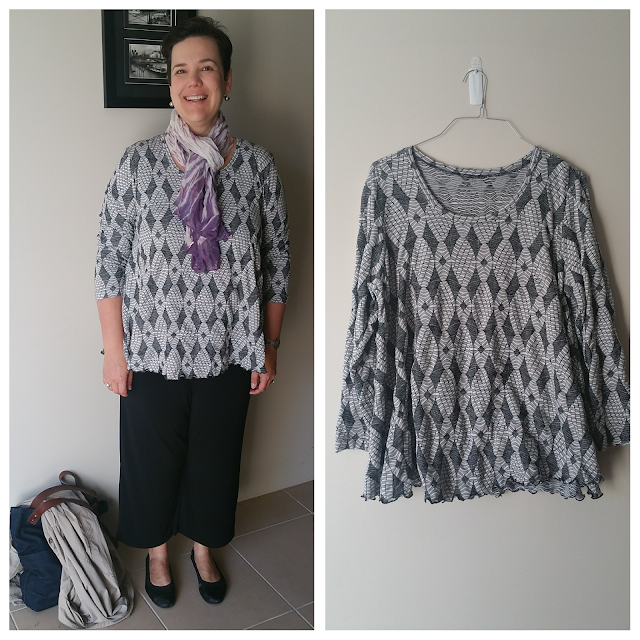 The fabric is from the Hoi An Central Market - I was very sad when I thought I'd ruined the garment, but I actually wear it a lot despite wondering if it was too short at the front/back. Who knew? The next three follow the pattern, with my usual modification of adding 6.5" to the length. As we're heading into winter I also added 1" to the sleeve length as "bracelet length" = cold wrists and we don't want that. This fabric is from Tessuti -- a viscose elastane jersey. It's actually quite thin fabric so perhaps not really right for warmer weather - but it's pretty and I like it. 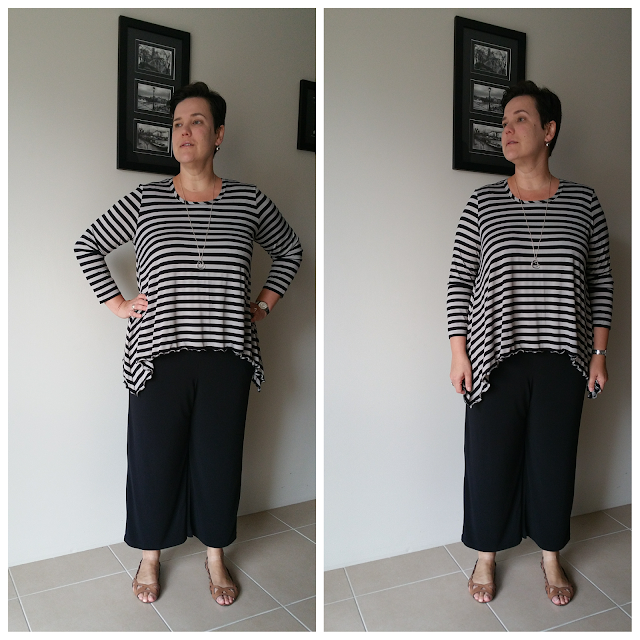 Again with the rolled hem (because I LOVE it)! More fabric from Tessuti - that you'll recognize from this Marianne Dress. 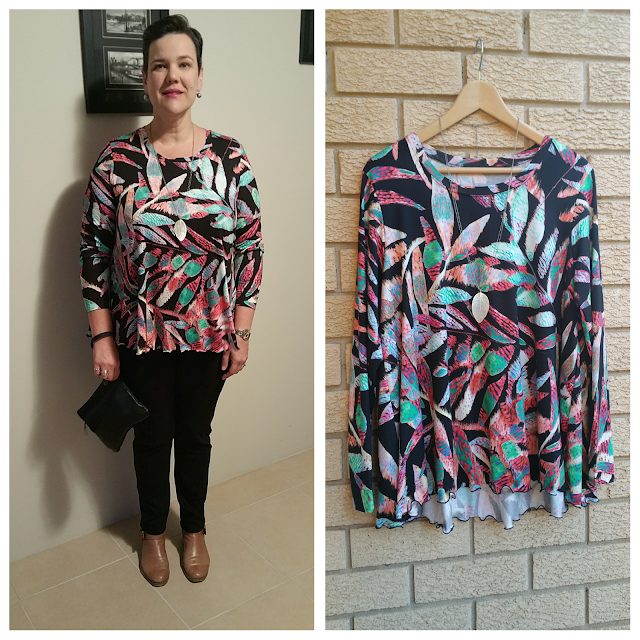 I liked the print so much I bought more of it with the intention of making a Mandy Boat Tee but that pattern isn't really working for me at the moment due to tight sleeves and too high neckline. I wore this out to dinner on Saturday night and it felt sufficiently fancy whilst still being very comfy. Modifications: added 6.5" to the length. Rolled hem. These all have 1" added to the length of the sleeve. Changes for next time: none for View B?